Following a successful trial towards the end of last academic year I’m pleased to let you know that we’ve been allowed trial access again to Secret Files from World Wars to Cold War: Intelligence, Strategy and Diplomacy from The National Archives and Taylor & Francis. This provides you with access to 144,000 pages of British government secret intelligence and foreign policy files source from the National Archives U.K. Content which is only available elsewhere by visiting the National Archives in London. You can access this online archive via the E-resources trials page. Trial access ends 26th March 2018. Thanks to a request from a HCA student the Library has trial access to the Black Newspaper Collection from ProQuest Historical Newspapers. This superb resource contains the archives of 9 individual newspaper titles that provide cultural perspective and insight to the events that shaped the United States in the 20th Century. You can access Black Newspaper Collection via the e-resources trials page. Trial access ends 28th March 2018. We currently have trial access to Literary Print Culture: The Stationers’ Company Archive and London Low Life, two fascinating primary source databases from Adam Matthew. So if you’re interested in the history of the book or of publishing, working and social lives in Victorian London, history of copyright, police and criminality in the 19th century, the workings of an early London Livery Company, commerce in London and more, then there may be something here for you. Left: Hints to men about town, or, Waterfordiana: containing a list and description of the most known,swell, flash-up, and downright introducing houses and celebrated seraglios … with the means employed to prevent venereal infection … / by a sporting surgeon (1830s) from London Low Life. Right: Architectural plan for Oxford University Press, Amen Corner (1913) from Literary Print Culture. Both databases can be accessed via the E-resources trials page. I’m happy to let you know that the Library currently has trial access to the Irish Newspaper Archive, the largest online database of Irish newspapers in the world covering nearly 300 years worth of history. You can access Irish Newspaper Archive via the e-resources trials page. Access is on-campus. For off-campus access you will need to use VPN. Trial access ends 20th March 2018. Thanks to a request from a student in HCA the Library currently has trial access to African American Newspapers, Series 1 and 2, 1827-1998 from Readex. These fascinating databases provide online access to approximately 330 U.S. newspapers chronicling a century and a half of the African American experience. You can access African American Newspapers via the e-resources trials page. This was the response from suffragist, Dame Millicent Garrett Fawcett, when asked why women would want the vote1. Today, 6th February 2018, marks 100 years since (some) British women were granted the right to vote for the first time through the Representation of the People Act. This was the culmination of a hard fought campaign and while it would take another 10 years before women would have equal voting rights to men in the UK, with the Representation of the People Act 1928, it was a victory for the suffragette movement. There are lots of events, exhibitions, programmes, etc., taking place today and this year to mark this important historic event but I wanted to delve into some of the primary sources available to us at the Library which allow you to find out more about the suffragette movement in the UK. The Library subscribes to a large number of online newspaper archives that will allow you to see what events were being reported on at the time and how they were being reported. Read full text articles, compare how different newspapers were covering the same issues and stories, track coverage from the start of the suffragette movement in the 19th century up to the Representation of the People Act 1918 and beyond. 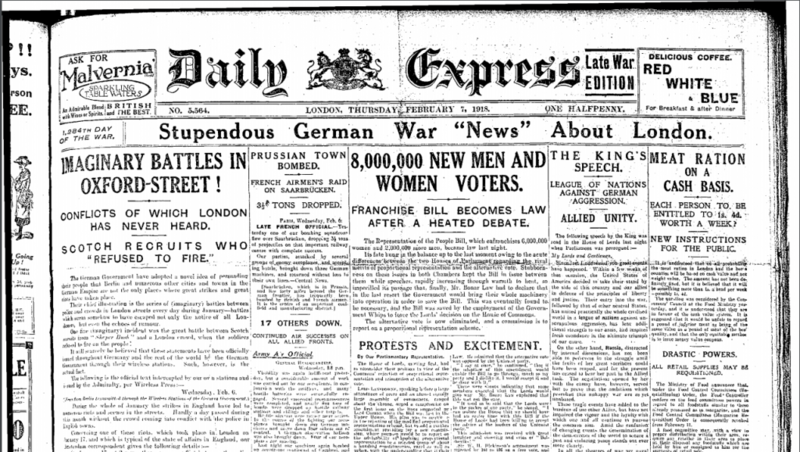 Screenshot from UK Press Online showing the front page of the Daily Express from Thursday February 7, 1918.